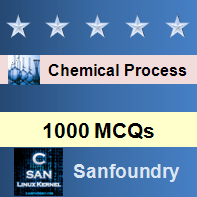 This set of Chemical Process Calculation Multiple Choice Questions & Answers (MCQs) focuses on “Ideal gas – II”. Explanation: Density is proportional to pressure. Explanation: Conditions for a gas to behave as predicated by the ideal gas law. Explanation: Gases at low pressure or high temperature behave as an ideal gas. 4. What is the volume of 20 gms of Oxygen in Litre at standard conditions? Explanation: At standard conditions, 1 mole of of gas occupy 22.4 litre volume. 5. What is the density of Carbon-di-oxide in kg/m3 at 27 degree celcius and 100 KPa? Explanation: density = (Pressure*Molecular weight)/(Gas constant*Temperature). 6. Usually while measuring the specific gravity of a gas, the reference gas that is taken is air. Explanation: Air is usually taken at the same temperature and pressure. 7. What is the volume of 2.5 gm moles Nitrogen gas at STP? At 100 KPa pressure and 300 K temperature, 2 gm moles of the gas occupy 20 cubic meter volume. 8. Which one has the lowest density at room temperature? Explanation: NH3 have minimum molecular weight. Explanation: 1 atm pressure and 0°C condition is known as standard temperature and pressure (STP). 10. At standard conditions, what is the volume of 1 kg mole of ideal gas?